Get free advice and estimates from Concrete Contractors in your city. Until the 1970s, building a home usually meant beginning with a crawl space structure or a full basement where possible. 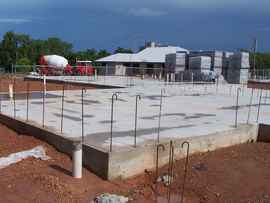 Since then, however, concrete slab 1 foundations have become more popular. The decision of to build a home on a slab or over a conventional crawl space is not merely a matter of preference. Many factors go into making this “foundational” decision. With the information below, we strive to make the choice easier for you. A crawl space works especially well on a sloped lot where the footers 2 can be designed to level the home’s flooring. This type is also preferable in areas prone to earthquakes since any shifting in the earth can permanently damage a concrete foundation. Soils like red clay almost always require the use of crawl spaces since they are not stable enough to support a cement slab. 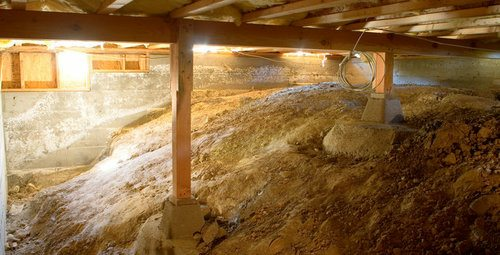 Crawl space foundations are recommended for dryer climates since moisture can accumulate there, and they are also recommended in flood-prone areas. A house with a raised crawl space is less likely to flood in areas where rising water is a real possibility. A concrete slab 1 foundation is better in a wet, but not flood-prone climate where moisture might accumulate within a crawl space. The vapor barrier 3 that lies beneath the slab will prevent mold growth from entering the home. A home built on a slab is closer to the natural grade of the home’s lot, preventing the need for steps into the house. This is especially advantageous for residents who are elderly or who have mobility issues. Since a crawl space can be anywhere from 16 inches to four feet high, a crawl space-built home needs to have entrance ramps to provide the same ease of mobility. 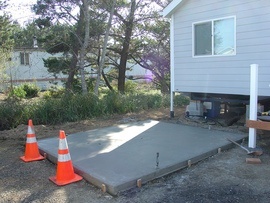 Whether using a concrete slab 1 or a crawl space, only a professional should prep the site and install the foundation. The integrity of the entire home depends upon this. A concrete slab 1 home begins with the proper preparation of the site. This starts with accurate grading 4 to not only level it but to provide drainage away from where the house will rest. The mix of soil and perhaps gravel that is used beneath the slab is extremely important. An improperly prepared lot can result in a shifting of the earth under the slab resulting in cracks, raised areas, or low spots in the concrete. Also, a plastic layer between the slab and ground will act as a vapor barrier 3 to deter moisture from affecting the concrete foundation in the future. Before the slab is poured, reinforced iron rods will be fitted to strengthen the slab and prevent shrinkage cracks from spreading throughout. Also, basic plumbing and any necessary electrical conduit will be installed. Despite these pre-pour preparations, this type of home will be built faster than a home with a crawl space foundation. In a home with a slab, the heating and air conditioning ductwork and some plumbing will be run through the attic instead of the flooring to provide access when the home construction is complete. A crawl space foundation also requires professional grading 4 and lot preparation. 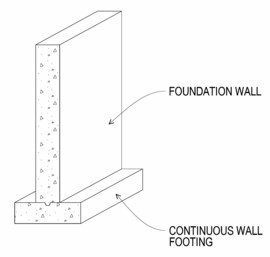 The concrete footers 2 that will support the home’s foundational need to be level and secure. In addition, the home’s gutter system and landscaping need to direct the flow of rainwater away from the crawl space, preventing moisture problems underneath the house. Even with this preparation, a heavy storm can result in water running into the crawl space. Therefore, a good grading 4 job to prevent water accumulation is essential as is a vapor barrier 3 and proper crawl space ventilation. Accumulated moisture below the wood floor joists can allow condensation to seep upward into the home’s flooring. It can also allow fungus and mold growth. The home’s plumbing, wiring, and HVAC ductwork and systems will likely occupy the crawl space, allowing easy access for maintenance and repairs. A slab foundation 5 will cost the home builder approximately $7,500 to $12,000 for an average-sized home. The variables include the size of the home, area where it is built, and layout of the home. This cost does not include the work of plumbers and electricians who need to lay their pipes and conduit within the slab before it is poured or the pre-treatment against termites. For example, a concrete foundation for a 1,500-square-foot, one-story home will cost approximately $3,200 for the concrete and materials needed. Labor for this foundation will cost about $7,000, for a total of $10,200. A crawl space foundation costs approximately $10,000 to $25,000, and it could cost as much as double the cost of a slab for the same home. The same variables we used in pricing a slab apply to this foundation. Because it is priced by the number of footers 2 needed, the number of foundation corners will factor into the price. In addition, the height of the crawl space is a variable that needs to be used in calculating the cost. Adding a ramp to provide mobility will cost $1,500 to $3,250. For example, a crawl space foundation for a 1,500-square-foot home with six foundation corners at the height of 24 inches will cost approximately $4,800 for the concrete, I-beam 6 supports, and other materials needed. Labor for this foundation will cost about $12,600, for a total of $17,400. Both a concrete slab 1 and crawl space foundation will be durable if constructed professionally from quality materials on a properly prepared lot. Expect a concrete foundation to last about 50 years or more barring any shifts in the earth beneath the concrete or tree root intrusion. A crawl space has about the same life expectancy, barring any violent flooding or insect infestation. While a leaky pipe or shower pan 7 may be easier to repair with a crawl space, hidden water leaks can also rot the surrounding wood. This can cause repairs to be more extensive. The same leak will not affect the integrity of a cement slab, but the repair may require removal and replacement of some of the foundation’s concrete. This is usually a more expensive repair when comparing the same-sized area of damage. A slab can be damaged by tree roots if large trees are left too close to the foundation of the house, but on the whole, it has a much stronger foundation than a crawl space. This is especially important if you plan to have heavy pieces of furniture in your home. A slab will prevent pests and vermin from inhabiting the area under a house. The earth under a slab is pre-treated for termites to prevent problems before they begin. With regular treatment and inspection, they can be avoided. However, some advantages of a crawl space are that the separation from the earth beneath the home discourages termite infestation, and a thorough termite inspection is possible. The earth beneath the “floor” of the crawl space is also pre-treated for termites before construction begins. A crawl space can even provide a storage area if it is built with mold-resistant materials and is well insulated. This will not be as spacious as a basement, but it can be an advantage over building a home on a slab where no storage space is possible. A slab can help insulate a home by eliminating the free-flowing air under the floor that is present with a crawl space. This can save on heating and cooling bills. Even a well-insulated floor cannot help a crawl space match the energy savings of a slab foundation 5 since outside air still circulates beneath the subfloor 8, causing temperature fluctuations in the home. A concrete slab 1 makes for a hard surface to stand and walk on. Even the best floor coverings will not make the floor as forgiving as a floor built over a crawl space. 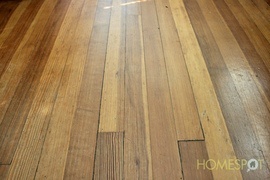 These floors, or at least the subfloors 8, are usually wood. This makes them more comfortable walking surfaces. Each foundation affects the resale value. Some people prefer the look of a home that is raised above the level of the surrounding lot as it will be with a crawl space foundation. This aesthetic advantage could make the home easier to sell. However, the biggest factors in resale value are how the foundation fits with typical foundations in the surrounding area and how well it is constructed. A concrete foundation in a neighborhood of crawl space foundations may look out of place and fetch a lower resale price and vice versa. A cracked foundation will almost surely repel possible buyers as will a poorly constructed or maintained crawl space. 2 Footers: A support for the foundation of a house that also helps prevent settling. It is typically made of concrete reinforced with rebar, but can also be made of masonry or brick. It is usually built under a heavier part of the house like a wall or column, to distribute the weight of the house over a larger area. 4 Grading: The process of evening out the ground's surface, making it either flat or sloped. How much does it cost to install a slab or a crawl space foundation in my city? Cost to install a slab or a crawl space foundation varies greatly by region (and even by zip code). To get free estimates from local contractors, please indicate yours. 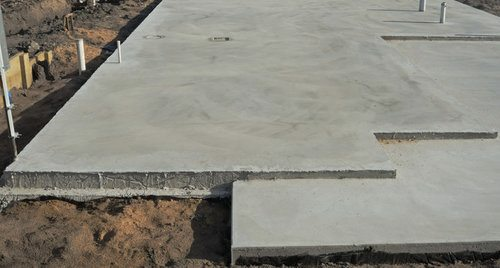 Cost Considerations: A poured slab concrete foundation typically costs $3 to $5 per square foot. A long, sturdy piece of structured steel or other construction material that is shaped like the capital letter I (with serifs) or H if turned sideways. Its shape allows it to support heavy loads without bending. Cost Considerations: The main factor in the cost of an I-beam is its height and weight per linear foot. The smaller that number is, the less expensive the beam will be. 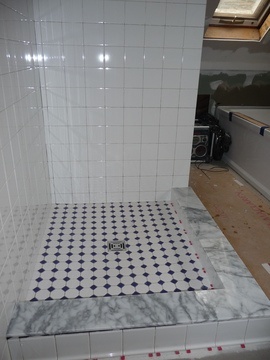 Waterproof base that protects the subfloor of a shower. Cost Considerations: Shower pans generally run around $300. They are generally more expensive than tile flooring.